I can’t wait for fall each year… I love summer, I’ll miss the long days and the relaxing times, but there is something so comforting about fall. It is one of my favorite seasons, and I love to spend a little time decorating for fall, without going overboard. 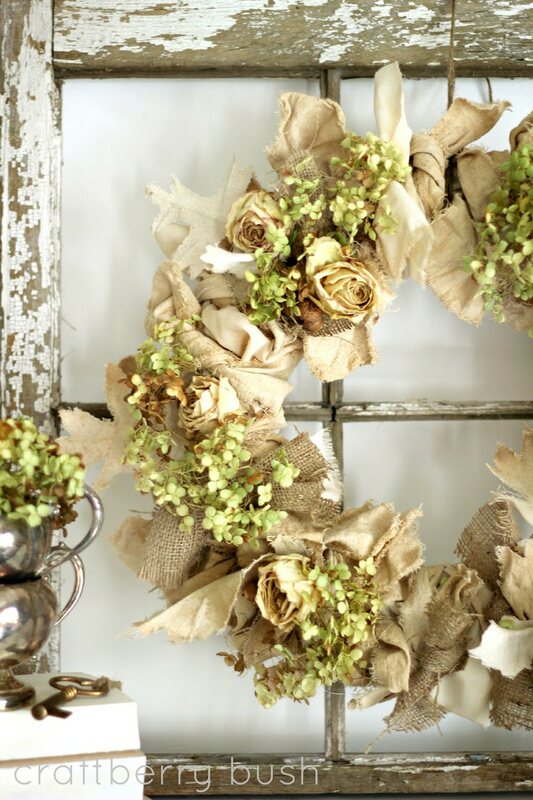 One of the best ways to do that is with a fall wreath DIY! Seen from the street, you can greet visitors with a blast of autumn coziness before they even get inside. A fall wreath kinda just tells the world that happy family times happen here, home is a special place, and that you hold dear the things in life that comfort and nourish us. Ok, if that’s too sappy for you, how about make a DIY fall wreath because they are so awesome, and crafty and fun! So there is plenty to choose from here, pick a style that works for you, make a quick trip to the craft store, and have a gorgeous fall wreath up by dinner! I’m starting with one of my favorite’s… Lucy at ‘Craftberry Bush‘ made this DIY burlap and hydrangea wreath that looks like it was made at a high end florists shop. She has simple instructions, she says she didn’t do a full tutorial because this is that easy! I love hydrangeas, and though they aren’t traditionally thought of as a fall flower, a dried hydrangea just screams “the end of the growing season”… So pretty! 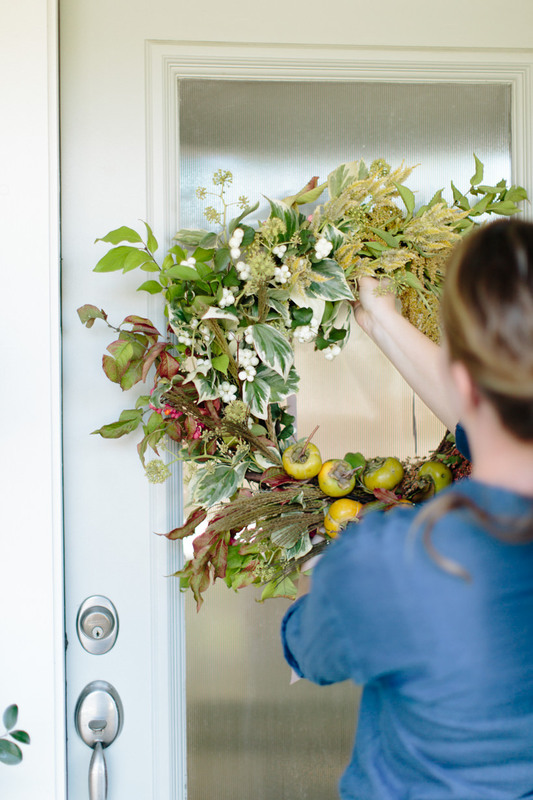 This DIY fall wreath is from ‘Cupcakes and Cashmere‘. 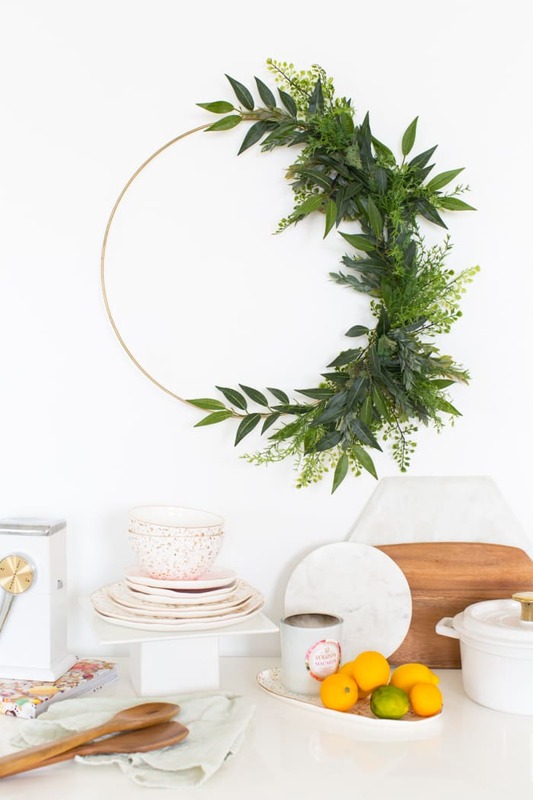 We love the minimal look of this wreath! If you haven’t read our post on Hygge decor, you should! This would fit in well with todays Scandinavian or Boho influences. And, it isn’t too cutesy! 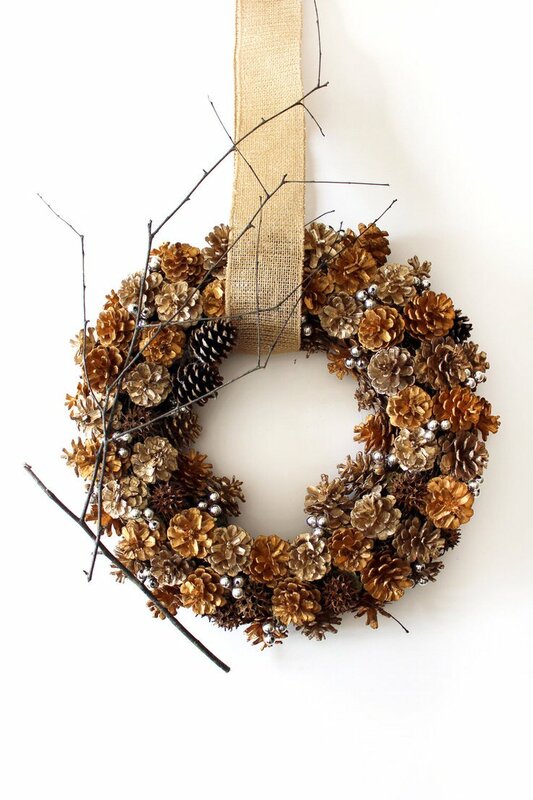 Julia from ‘Tag & Tibby‘ repurposed a clearance pinecone wreath into this fall wreath DIY with just a glue gun and a couple of things she had laying around! Easy homemade wreath for someone who wants it quick and simple. If you really want the most gorgeous fall wreath DIY, then try this tutorial from ‘Camille Styles‘. They created this florist style wreath with foliage and harvest items that will dry with the wreath and still look amazing. What a fun project,t and she has tons of pictures walking you through the project. Can you see yourself hanging this on your front door? You could be! Photos by Hannah Grace Photography. From ‘Uncommon Designs‘, this fabric and felt DIY fall wreath is perfect for those of us looking for a little color… cute and sophisticated at the same time! These yarn or twine wrapped letters make a pretty hanging on any door, by ‘Sarah Ortega‘. Easy, and can be dressed up for both fall and winter, and even the holidays by adding a little frill in the appropriate color/style. This monogram fall wreath DIY by Linda at ‘Craftoholics‘ can be colorful like her version, or more subtle if that fits your style better. (I personally LOVE the polka dots!) Cute! ‘Little Things Bring Smiles‘ brings me a great big smile…’cause I love the simple nature of this acorn DIY fall wreath… and I really do mean nature! It’s made, after all, with acorns. And a can of this lovely color spray paint. So well chosen was this color, I thought she had found an amazing seed pod with this gorgeous hue! Love it! We hope you loved our post on Fall Wreath DIY! We think you will also want to jump right on over to 18 Classy Fall Decorating Ideas and 11 Ideas for Pretty Pumpkins! And don’t forget to pin a favorite (or two!) for later! The lush wreaths from Lucy at Crafttberry Bush, Camille Styles, and The Night Owl Blog truly display the richness of Autumn!